Many iPhone 6 users may encounter such problems as losing their precious data due to various reasons such as system crash, iOS upgrade, device stuck, water damage, etc. As James said, the data on it may means more than the device. Generally speaking, Apple official solution would ask you to restore data from iTunes or iCloud backup. This method may put your current data in the risk of being lost again. And it's time-consuming since you can't preview the lost files. Moreover, what if the one who has lost data didn't make any backup at all? Thanks to the development of some iPhone data recovery software, which make it possible to recover lost iPhone data without backup. Here we are going to introduce 5 best iPhone 6 data recovery software to help someone like James recover lost data from iPhone 6, 6 Plus, 6s, 6s Plus, etc. One of the reputed iPhone 6 data recovery programs is definitely Joyoshare iPhone Data Recovery. This is a fast solution to help Apple users to restore lost data from iPhone 6, 6s, 7, 8, x and new series in a few clicks only. 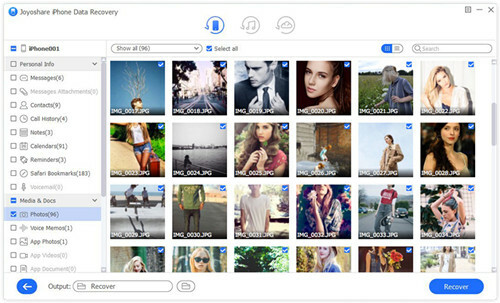 As a powerful iPhone data retrieval tool, Joyoshare iPhone Data Recovery is capable of recovering more than 20+ kinds of data, including messages, contacts, call history, notes, calendars, photos, videos, third-party app data like WhatsApp, Kik, Viber messages and attachments, etc. No matter how you lost these files, such as accidental deletion, forgotten passcode, device broken, etc. it will get them back without any hassle. With the support of 3 smart recovery methods, Joyoshare iPhone Data Recovery can retrieve missing data from iTunes and iCloud backup or from iPhone directly even if you have no backup. Besides, you can preview the lost files and select the ones you really want, which will save you much time. 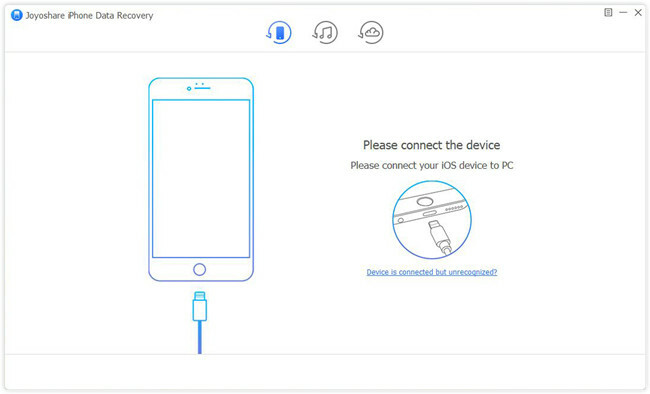 Next let's show you how to recover lost data from iPhone 6 with Joyoshare iPhone Data Recovery. First of all, get Joyoshare iPhone Data Recovery free download from the official site and then install it on your PC or Mac. Connect your iPhone 6 device to the computer if you have no backup file. When Joyoshare detected your iPhone successfully, you can now choose the recovery mode from "Recover from iDevice", "Recover from iTunes" and "Recover from iDevice" on the top menu bar. Then select the data types such as Messages & Attachments, Call History, Photos, etc. and next click the "Scan" button to let Joyoshare scan and analyze your lost files. Note: If you choose the second and third recovery modes to restore data from backup, you don't have to connect your device to the computer. Wait until the scanning process is completed. Now you can see all recoverable files shown in categories. Preview them one by one and pick the ones you want. Next hit the "Recover" button to export them to the local folder of your computer. 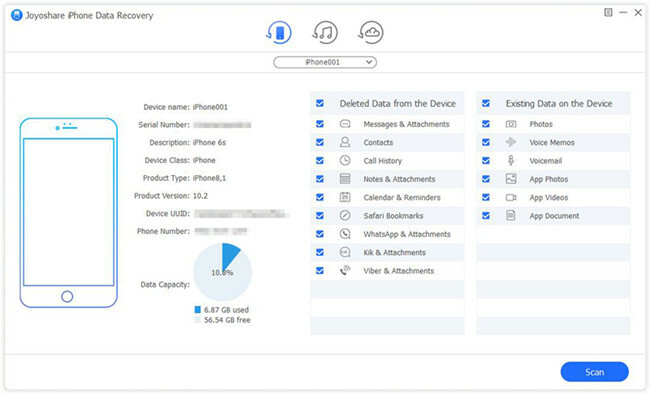 Another available iPhone 6 data recovery software in the market is iMyFone D-Back. With this program, you can easily recover deleted or lost data from not only iPhone 6 and other iPhones, but also iPads and iPod touch. It provides four recovery modules that allow users to recover data from devices, iTunes backup, iCloud backup or via smart recovery. 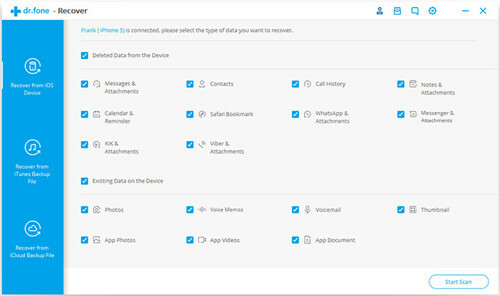 Just like Joyoshare, iMyFone D-Back iPhone Data Recovery also supports a wide range of data types including WhatsApp, WeChat, Line, photos, messages, contacts, etc. 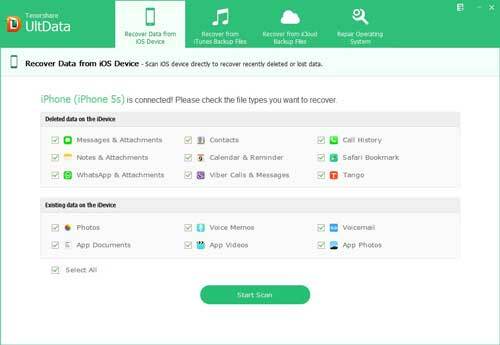 dr.fone - iOS Toolkit from Wondershare includes a module called Recover that can help iOS users recover lost data from iPhone, iPod and iPad. It can recover up to 18 file types like photos, messages, videos, photos, notes, reminders, contacts, etc. After scanning your device or extracting iCloud/iTunes backup, you're freely to preview and choose any item you want to restore to your device or computer. Additionally, it is fully compatible with almost all iOS devices and versions including the latest iPhone XS and iOS 12. Tenorshare UltData iPhone Data Recovery is another reliable iPhone 6 data recovery software tool that claims to support 35+ file types, including WhatsApp, contacts, SMS, photos, etc. Like other similar data recovery program, UltData can also restore data directly from iOS device, iTunes and iCloud backup. Plus, it support to retrieve missing data in any possible data loss scenarios like mistaken deletion, factory reset, virus attack, locked or disabled device, etc. The last iPhone 6 data recovery program introduced here is named Syncios Data Recovery. 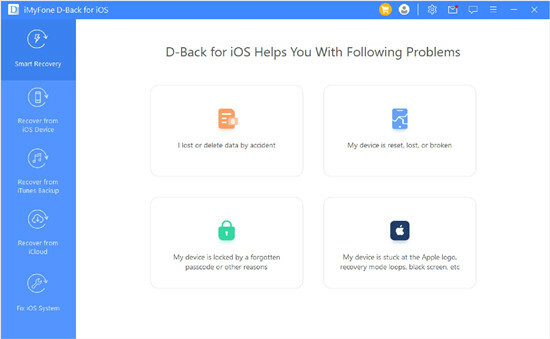 This smart tool can help you retrieve deleted data on iPhone 6, 6s and other iOS devices in three methods, namely iPhone 6 data recovery without backup from iPhone directly, from iTunes backup files, from iCloud backup files. 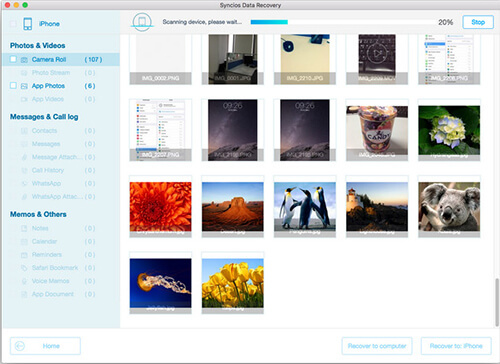 The supported file types include photos, videos, messages attachments, call log, Safari bookmarks, reminders, etc. So these are top 5 best iPhone 6 data recovery software recommended in this article, and each one has its advantages and disadvantages. You can pick the most suitable one according to your requirements. If you want to restore lost iPhone 6 data with highest success rate in a fast speed, Joyoshare iPhone Data Recovery would be a nice choice. Of course, there are many other similar programs in the digital market. If all the aforementioned apps cannot meet your needs, you can continue to search on the internet and start to recover your missing data until you find a satisfied one.